Australian champion sire Redoute's Choice died Monday morning at Arrowfield Stud. The 23 year-old son of Danehill was humanely euthanized after suffering a traumatic loss of mobility which could not be restored, despite intensive care by Arrowfield's veterinary and stallion teams. “Redoute's Choice is such a big part of all our lives, and right now it's hard to imagine Arrowfield without him,” said John Messara, chairman of the Arrowfield Group. “He has given us so much, Arrowfield has been built on his back and he's allowed all of us and many, many other people to fulfil our dreams and ambitions. Redoute's Choice's death comes in a season of fresh recognition and achievement, including his 34th Group 1 winner Galaxy Star, a trio of million-dollar colts at the Magic Millions Gold Coast Sale and a spectacular 3-year-old campaign by his best racing son, The Autumn Sun, who won his fifth Group 1 race, the Rosehill Guineas, last Saturday. The Autumn Sun's place on the Arrowfield roster is already reserved, alongside four other Redoute's Choice sons: record-breaking champion sire Snitzel, leading sire Not A Single Doubt, Scissor Kick, whose first yearlings are being offered at 2019 sales, and Pariah, who served his first book in 2018. 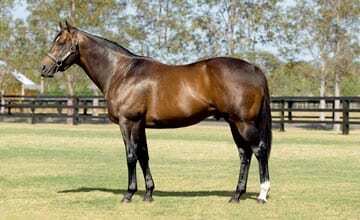 Almost 13 years after he won the first of his three Australian General Sires' Premierships (the country's leading general sire title), Redoute's Choice remains a top-five Australian sire and is likely to secure his first broodmare sires' title in the country this season, with earnings of $15.2 million (Australian dollars) and 15 stakes winners to date, among them Group 1 winners Extra Brut, Amphitrite and Arcadia Queen. Redoute's Choice was bred by Muzaffar Yaseen, foaled on Aug. 15, 1996 and retained to race in the now-famous yellow, red, lime, and orange Teeley Assets colors. Yaseen sent him to Melbourne trainer Rick Hore-Lacy who prepared the strikingly handsome colt throughout his 10-start, five-win, $1.6 million racing career. He made headlines and history immediately, after winning a listed race in his 2-year-old debut, and lining up a mere seven days later in the G1 Blue Diamond Stakes, which he won by two lengths from his great rival Testa Rossa. His spring 3-year-old campaign began with a 1,200-meter weight-for-age victory in the G1 Manikato Stakes and peaked in the heroic, one-for-the-ages battle with Testa Rossa for the G1 Caulfield Guineas, won by Redoute's Choice only in the final meters. Redoute's Choice returned in the autumn to add a fourth Group 1 success, defeating Miss Pennymoney and Intergaze in the G1 C.F. Orr Stakes, and retired to Arrowfield as Australia's champion 3-year-old miler. He served 134 mares in 2000 at a fee of $30,000 which did not increase until his fifth season, in 2004. That was after the appearance of his first stakes-winners Not A Single Doubt and Tahni Girl, the 2003/04 champion first-season sire title and his first million-dollar yearling. It was in the 2004/05 racing season that Redoute's Choice, with 137 runners from two crops of racing age, emerged as a potential champion stallion and the inheritor of Danehill's crown. He unleashed 16 stakes-winners, four at Group 1 level: 3-year-old filly Lotteria and 2-year-olds Fashions Afield, Stratum, and Undoubtedly. Only Danehill and Zabeel headed him on the Australian General Sires' Premiership and his 2005 Inglis Easter Sale results included the Tugela colt, sold for a then all-time Australian-record price of $2.5 million. Redoute's Choice claimed his first General Sires' Premiership with three crops racing in 2005/06, the season of six Group 1 winners: Champion 2-year-old Miss Finland, Snitzel, God's Own, Nadeem, Fashions Afield and Lotteria. That season also marked the arrival of his statistically most notable crop, eventually the source of 21 stakes-winners from 107 named foals – a strike rate of 19.6 percent. Flag-bearer for that 2009 cohort was world champion sprinter, Horse of the Year and five-time Group 1 winner Lankan Rupee who helped propel Redoute's Choice to his third and final Premiership, in 2013/14. Snitzel's second-place finish in 2014 resulted in a father-and-son Premiership quinella unprecedented in Australian thoroughbred history and signaled the passing of the baton to the next generation of the Danehill dynasty at Arrowfield. Redoute's Choice now has 22 stakes-siring sons, 10 of them also Group 1 sires. They are responsible for 279 stakeswinners, while his daughters have left 86 stakeswinners, including 13 at Group 1 level. This entry was posted in Bloodstock, NL List and tagged arrowfield stud, Australian horse racing, Horse Racing, John Messara, Muzaffar Yaseen, redoute's choice, Teeley Assets by Edited Press Release. Bookmark the permalink.